Yes, the title is correct. We are indeed having another snow day. Boooo!!! 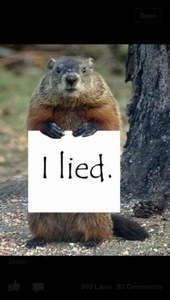 I think the groundhog and Mother Nature got their messages crossed. It’s Spring! Where’s the warmer weather and the spring showers and the sun? I wish the temperature would start staying closer to 50+. I want to wear flip flops and t-shirts without a coat. This is the 2nd snow cancelation in the last few weeks where the ridges have gotten fun sled riding, snowman building, snowball fighting snow and I, well I barely have any. But because many children live on the hills and the busses have to drive the roads we are canceled. At least this time it looks like my backyard may still have enough of this quickly melting snow that the kid may get to play a little before its gone. And since they’ve already taken spring break (3/26-4/1) away and now we only get Friday and Monday off, I guess an extra day off this week isn’t horrible. I wish that we were getting more days like last Saturday. It wasn’t super warm but close to 50 and sunny. A great day for an Easter Egg Hunt. It was a fun time. New friends invited us up to their house for their annual hunt and the kids had a blast. There were roughly 13 children ages 1-5 and they loved it. Even the little ones had fun looking at all the candy filled eggs that littered the yard. And afterwards they munched on hotdogs, dirt cake cups and candy. It was a very fun time! I hadn’t really had time to try new craft projects the last few weeks mostly just worked on more of the same items. It’s been a little busy but I’m hoping to try some new things the next few weeks. Hopefully, I can get a few things finished before my mom comes for a visit. That will keep me busy for a while and maybe I’ll have a few things she can take back to my niece! I can’t wait! Previous It’s been a while Next Yay! Sun! Good-bye Winter!